It's fall, which means I love to eat everything pumpkin - pasta, soup, and of course, dessert! I love traditional pumpkin pie, but I also love the combination of pumpkin and chocolate. Preheat oven to 350 degrees. Line bottom and sides of a 9-by-13-inch baking pan with parchment, leaving an overhang on all sides. Grease with nonstick cooking spray. In a medium bowl, whisk together flour, pumpkin pie spice, cinnamon, baking soda, and salt; set aside. In the bowl of a stand mixer fitted with the paddle attachment, cream butter and sugars on medium-high speed until smooth; beat in egg and vanilla until combined. Beat in pumpkin puree. If the mixture looks curdled, do not fret. Reduce speed to low, and mix in dry ingredients until just combined. Fold in chocolate chips and pecans. I love stir frys, even more when they are spicy. But they are so healthy and full of flavor that they make a great dinner. 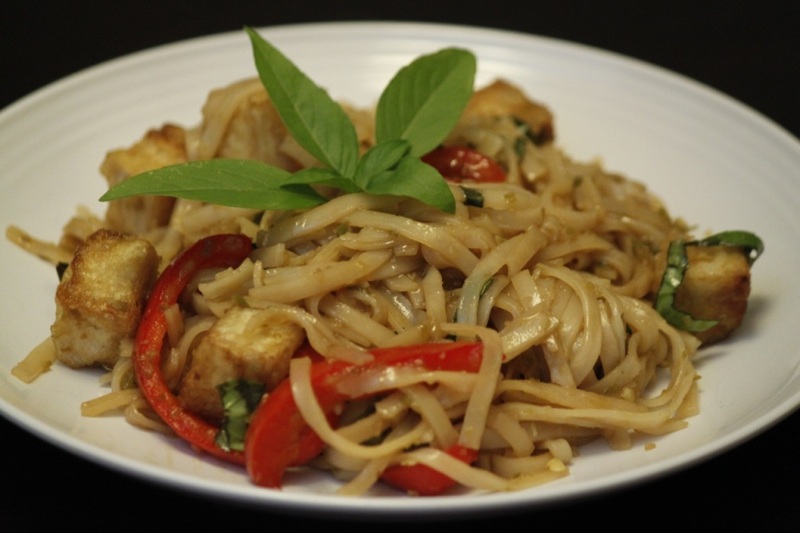 This one calls for tofu, which I happen to love, but it would work just as well with chicken or beef. For the sauce: Pulse the chiles, garlic, and shallots in a food processor to a coarse paste, about 15 pulses, scraping down the sides of the bowl as needed; set aside. In a small bowl, whisk the broth, fish sauce (or soy sauce), sugar, lime juice, and cornstarch together; set aside. For the noodles: Bring 4 quarts of water to a boil in a large pot. Remove the boiling water from the heat, add the rice noodles, and let sit, stirring occasionally, until the noodles are tender, about 10 minutes. Drain the noodles and set aside. Spread the cornstarch in a shallow dish, then dredge the tofu in the cornstarch and transfer to a plate. Heat 2 tablespoons of the oil in a 12-inch skillet over medium-high heat until just smoking. Add the tofu and cook, turning every few minutes, until all sides are crisp and browned, about 8 minutes. Transfer the tofu to a paper towel-lined plate and set aside. Wipe out the skillet with paper towels. Heat 1 tablespoon more oil in the skillet over medium-high heat until just smoking. Add the snap peas and bell pepper and cook, stirring frequently, until the snap peas are crisp-tender and begin to brown, 2 to 4 minutes. Transfer the vegetables to a small bowl. Heat the remaining 2 tablespoons oil in the skillet over medium heat until shimmering. Add the processed chile mixture and cook until the moisture evaporates and the color deepens, 3 to 5 minutes. Whisk the broth mixture to recombine, then add it to the skillet. 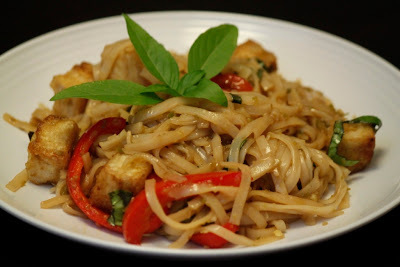 Stir in the drained rice noodles, cookied tofu and vegetables, and basil, and cook, tossing constantly, until the sauce has thickened and the noodles and vegetables are well coated and heated through, 2 to 3 minutes. Serve.